On a hill in Galatas called Palia Vrisi (Old Fountain), we built two luxurious villas situated within a secluded private setting. It's called Palia Vrisi because many years ago there was an old fountain where the people of Galata would get plenty of water for themselves and their crops. This explains the variety of trees, aromatic plants, and bushes on the property. The villas were carefully built to compliment the natural beauty of the environment. Combining luxury, comfort and nature's beauty, there is complete harmony between the villas and the environment. Come join us for complimentary organic extra virgin olive oil and tsikoudia, the traditional Cretan drink as a symbol of our Cretan hospitality. 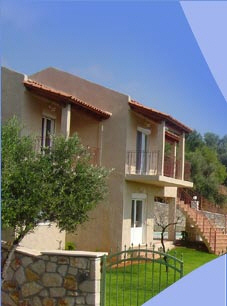 The villas are open throughout the year. These two newly built villas, on 7.000 sq/m of land, are surrounded by olive trees, lemon trees, almond trees and orange trees including very rare century old cider trees. Built on a hill, the view from the villas is outstanding. On one side you have the White Mountains and on the other you have the crystal blue Mediterranean sea. It is natures paradise. As you gaze at the sensational beauty of your surroundings you can look to the northeast and see Hania, the second largest city in Crete. Each villa has its own private pool with the latest wave generating technology and central air conditioning heating units. The grounds and landscaping are enclosed with natural stone walls and filled with many kinds of herbs and flowers including over 50 rose plants. There are large balconies and wooden cathedral ceilings throughout the villas. The villas have state of the art windows with screens that open vertically and horizontally including the slide doors. The windows are dressed with hand made designer curtains and the furniture has been tastefully chosen to provide comfort and style. Each villa has a Jacuzzi and shower with hydro massage. The high quality of accommodations offers you luxury and sophistication which will make your experience unforgettable. The three bedroom villa has 120 sq/m of comfortable living space, while the four bedroom villa has 200 sq/m on 2 floors. The two floors are connected by an indoor wooden staircase and has an extra spacious living room. Both villas consist of an entrance hall which leads to an open area sitting dining room which is tastefully furnished. The living room has satellite TV, internet access, and a comfortable sofa which turns into a bed. The kitchen is fully equipped with a full size stove, dishwasher, and refrigerator. The three bedroom villa has one shower and one bath with Jacuzzi and hydro massage. The four bedroom villa has one bathroom and two showers with Jacuzzi and hydro massage. 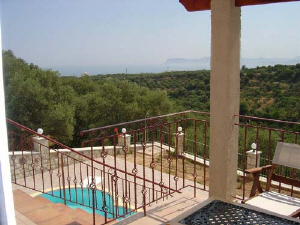 Villa is available per night on a pro rata basis. The above prices are for the villa, not per person.